Cocktail (Prawn Cocktail) and now Mocktail. One of those days when you feel you want to try something new or let's say when mangoes are already there in your house and also when hot weather is really killing you? 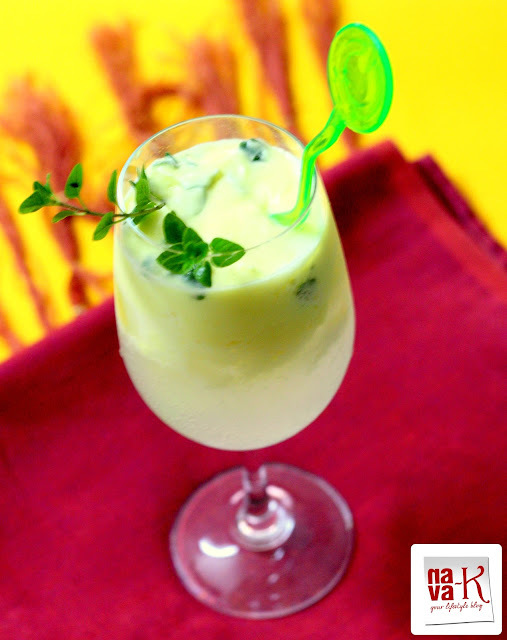 I bet you won't mind spending some time in your kitchen for coming up with a Mango Mocktail? Mango of course the star ingredient. Always a favorite for most of us (Mango Coconut Jelly, Prawn Mango Curry, Mango Coconut Cake & Mango Cucumber Salad)? Or am I assuming without gathering my facts? Most probably (Mango Cheesecake), I can conclude if not all, some of us I bet will appreciate a Mango Mocktail. A fruity Mocktail (Fried Apple Fritters, Poached Pears In Citrus Syrup & Watermelon Sorbet). What and how to Mango Mocktail? 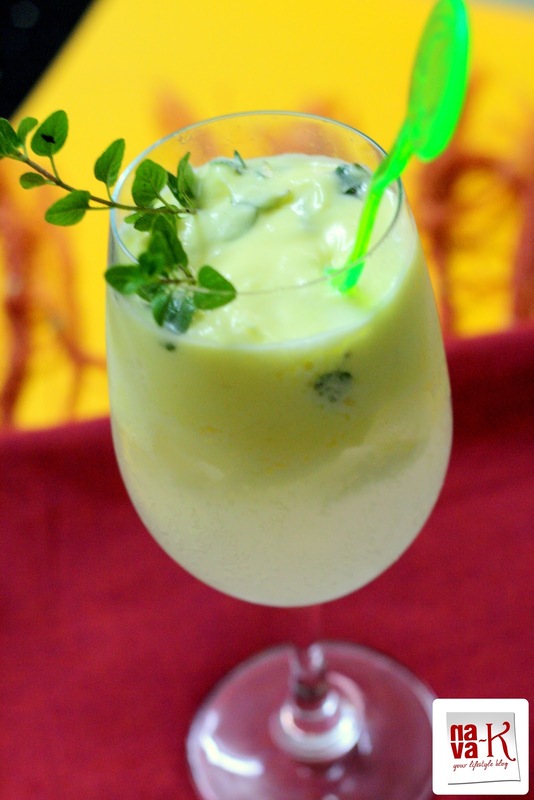 Mangoes, sparkling water, yogurt, honey and thyme or mint leaves. Pulse the first four ingredients, pour into glass, add thyme and ice cubes. Wow! Fresh burst and wouldn't you agree this Mango Mocktail will like instantly light up a broad smile on your face? This sounds great. Perfect for a hot day. Refreshing and healthy! I normally make it without 7-Up but I use sparkling water and a small squeeze lime or lemon for the extra zing. That is a pretty color and looks so refreshing! Delicious love to try when I can hold of mango. Thanks all you great people. Kellie - its yellow mangoes. Do you mind If I copy your recipe? I'd like to present this to our Food and Beverage Festival in our school. :) This is soo refreshing! Kellie - please go ahead, after all thats why I share my recipes via blogging. Its an honor for me if others would love to copy my recipe.